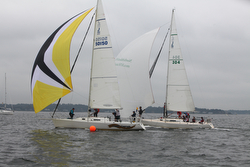 (Larchmont, NY)- Thirty-six J/Boat owners participated and contributed their boats, in a fleet of 48 total, for the 2018 edition of the Storm Trysail Club and the Larchmont YC annual extravaganza for college sailors- known as the Intercollegiate Offshore Regatta (IOR). The event has become by the most popular event in all of college sailing, with 45 colleges, universities, and academies gathering together to go racing in one-design classes and offshore boats on western Long Island Sound in the first weekend of October. What does that mean to the world of sailing? Simple. It signals that J/Sailors have PASSION! J/sailors and J/owners have a passion for sailing, a passion for growing the sport of sailing, a passion to include women and youth in the future of sailing at all levels- from beginners to the world’s best at all levels of the sport. For example, consider J/Boat owner’s commitments to this event- 75.0% of the entire fleet- J/105s (12), J/109s (9), J/44s (5), PHRF (10)! In the one-design classes, the racing was generally close around the windward-leeward race tracks. In the J/44 Commodore James D Bishop Division for USA Service Academies, the winners were the US NAVAL ACADEMY on Bill Ketcham’s MAXINE with an amazing record of 1-1-2-1-4 for 9 pts total. Silver was the US COAST GUARD ACADEMY on GLORY with a 2-3-4-2-2 tally for 13 pts total. Rounding out the podium was MASSACHUSETTS MARITIME ACADEMY’s sailing on Chris Lewis’ KENAI with a total of 4-2-3-4-1 for 14 pts. Of note, the MMASA won a tie-breaker over SUNY MARITIME’s crew on CHARLIE V.
The J/109s were completely outclassed by the TUFTS JUMBO’s sailing on Cory Eaves’ FREEDOM, their 3-1-3-2-2 total for 11 pts simply dominating their class. Second was the NORTH CAROLINA STATE crew on Mike Sleightholme’s APSARA with a 4-3-1-9-4 tally for 21 pts, winning a tiebreaker. Losing that tiebreak was the ROCHESTER TECHNOLOGY team on Albrecht Goethe’s HAMBURG with a tally of 1-4-6-7-3. Not surprisingly in the huge J/105 division, having a lot of offshore talent onboard their crew were the winning COLLEGE OF CHARLESTON crew racing the YOUNG AMERICAN boat- crushing their J/105 one-design class with just straight bullets for the most dominating performance in the entire regatta! Second was VANDERBILT UNIVERSITY on ECHO and third was WEBB INSTITUTE on HOONIGAN. In PHRF 2 Division, it was FORDHAM UNIVERSITY winning on board Bill Ingraham’s J/24 TENEBRAE with a 1-1-2-1-4 tally for 9 pts total. 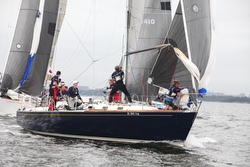 Similarly, in PHRF 3 Division, it was VILLANOVA UNIVERSITY simply taking their division “to the cleaners”, winning with a commanding margin of 6 pts due to their 1-1-1-3-4 tally for just 10 pts. 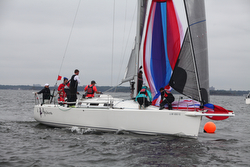 Second was YALE UNIVERSITY’s team on Jon Yoder & Bill Gassman’s J/100 BLACKCOMB. For all STC IOR race results, click here For more Storm Trysail Club Intercollegiate Offshore Regatta sailing information Add to Flipboard Magazine.